Teabag Digital have been acquired by Intermarketing Agency. Click here to Read More. We teamed up with the guys from CitySetups to launch their online relocation and concierge service. Their idea was take the pain out of moving to London from abroad for academic studies. To help explain the whole process and benefits of CitySetups, we created an animation to showcase their services to potential clients. We also created the pimped out online platform complimenting their expert knowledge to deliver just this. 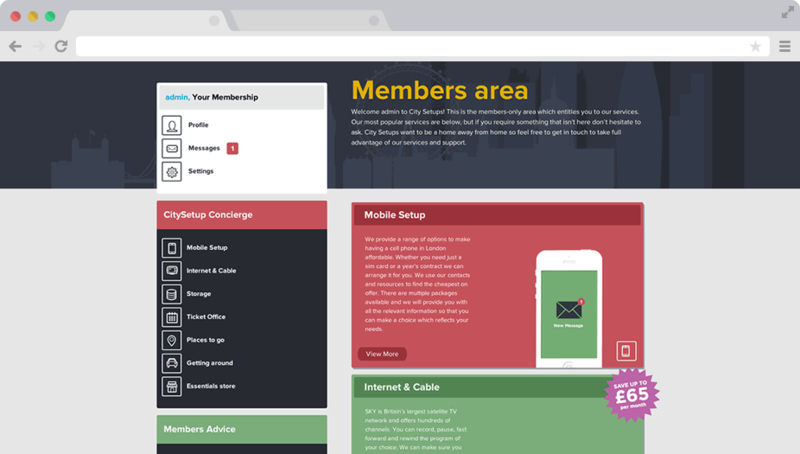 Using WordPress and BuddyPress to manage the growing community, enabling their clients to access the services they need when they need them. Its a modern concierge, forms are used for requests that can be automated such as Television or Internet subscriptions, while maintaining the personal touch throughout the site with live instant messaging and a simple but beautiful DM system.